These photos are of Uluru, aka Ayers Rock. It's supposed to be a very spiritual place for the Aboriginals, but for me, it was just a big, fascinating rock. 2/3's of it are below ground. Some people climb it, and many have died, either from falling, or exertion, or lack of water. It's incredibly hot and dry there, even in the winter. 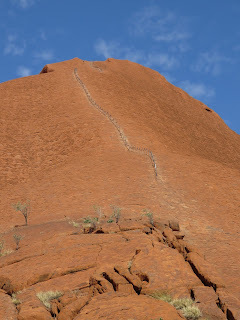 The Aboriginals don't want them climbing because it's a spiritual thing for them. The bright orange comes from the sun reflecting off the red-brown surface near sunset. It really lights up!